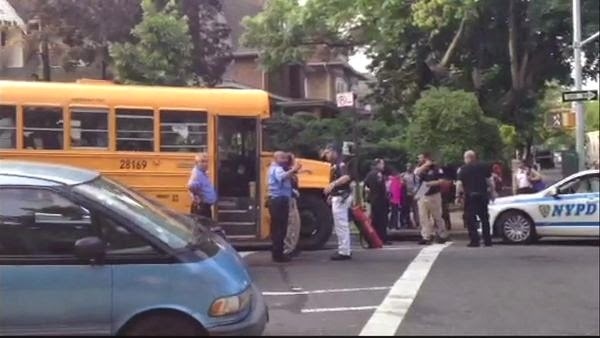 Last week on Tuesday almost one dozen children were sent to the hospital after someone on their school bus set off a smoke bomb. The bus was on its way to the Brooklyn Dreams Charter School in Kensington, carrying 40 children between the ages of 5 and 11. At about 7:20am the yellow school bus stopped at the corner of Ocean Avenue and Dorchester Road due to the heavy smoke in the bus. The bus still had about 12 more blocks to go before arriving at school. Some of the children were transferred to the hospital as a precaution. All were released soon after it was clear that none of them were harmed. Police believe that someone on the bus set off the device, which was a type of firework that is designed to release plumes of thick smoke. When such a device is exploded inside a closed, contained space, the police added, there is a danger that the smoke can cause breathing problems or other medical ailments.